Premiere of 4 never performed before XANDRIA songs! Those lucky 20 (per city) who can get their hands on a VIP-upgrade will have the unique experience to.. Meet the bands! | Receive a VIP laminate pass! | Have an early entry and... | Witness an acoustic session of all bands performing 2 songs. 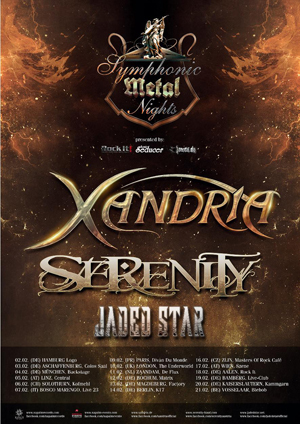 The 2 songs performed by XANDRIA will be 2 of the 4 songs that we have never performed before and that won't feature in the show setlist. Premiere of 4 never performed XANDRIA songs! Convinced? Then your next steps are to: purchase a ticket for the show and to get your VIP-upgrade!